Not long ago I started my first epic fantasy: Mistborn. I found it to be hugely satisfying. I've read a scant number of fantasy novels so it was a real treat to read this series. There's always a bit of a let down when you finish a series, more so than a single novel. You get to know the characters and the lines between your world and theirs start to blur. Then it's over. Done. There's not even a Facebook page to catch up once in awhile. 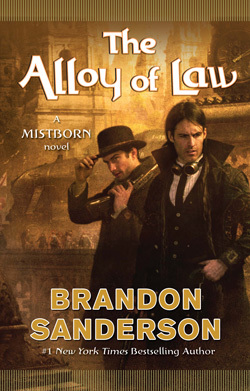 Brandon Sanderson, however, is attempting to ease my melancholy with a new book, based on the world of Mistborn. Sanderson gives the world of Scadrial the Wild West treatment in this rollicking adventure tale set 300 years after the popular Mistborn epic fantasy trilogy. This “side deviation” gives up swords for guns, and while the three-part magic system of Allomancy, Feruchemy, and Hemalurgy continues to play a crucial role in the story, Scadrial itself is on the cusp of modernity. Wax, a lawkeeper gifted with both Allomantic and Feruchemical powers, has returned to the circular city of Elendel to take his uncle’s place as Lord Ladrian. When a gang of thieves known as the Vanishers begins stealing from railcars and kidnapping ladies, Wax, his miscreant buddy Wayne, and the intelligent and pretty Marasi decide they are honor-bound to uncover the perpetrators and save the victims. 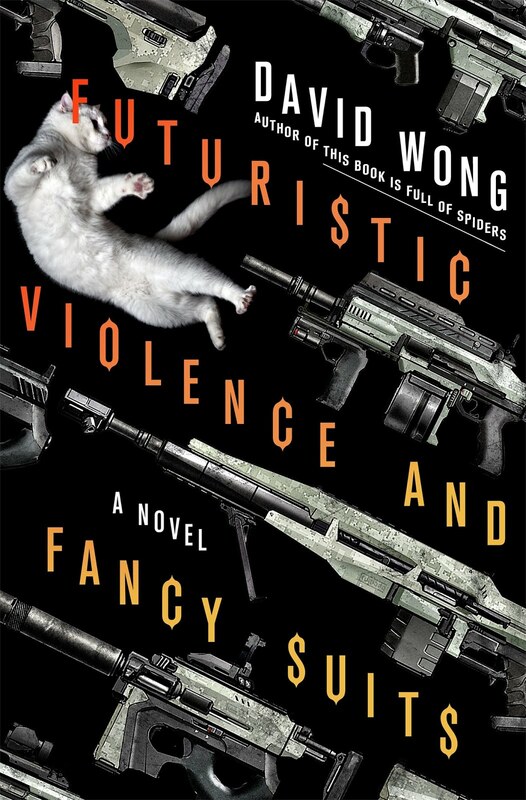 Part Sherlock Holmes, part X-Men, this exciting stand-alone adventure is full of close shaves, shootouts, and witty banter. I pre-ordered my signed and numbered copy today. You can too, just click on his name at the top of this page. Click here to read the first few chapters for free at Tor.com. Orange or Pink is the title to a piece of flash fiction I wrote for the NYC Midnight Flash Fiction Challenge 2011. Check out my previous post for more information on the contest and a bit of the genesis of this story. I'm posting it here now. This is my first entry in the first round. Comments and feedback are appreciated. A man is caught stealing smart phones that he's been selling to help pay for his sister's chemotherapy. I stood on the center line of the store, one foot in pink the other in orange. “Orange or pink?” I said aloud, trying to determine which brand of phones to push. T-Mobile occupied the west side of the store, AT&T the east. A classic turf war. Nobody responded. The store didn’t open for another half-hour so the only people around were my manager and my coworkers. As the senior sales rep on the floor, they all knew to defer to me. My manager, Tilly Scott, had yet to emerge from his office. Tilly was a bear of a man, but his temperament was as soft as his name was girly. “I’m feeling awfully pink today,” I said. I moved over to the pink side to prepare the displays. Not only was I feeling pink, but the manufacturer’s promos were better than what the orange side was offering—which makes them more attractive to customers. A couple more big sale days and I’d beat my quota by twenty-five percent, which meant a bonus. I shrugged and followed him back. He opened the office door, and I’d have to say I was a bit surprised by the chicken. Tilly lumbered to his chair. He didn’t so much as sit in his chair as he did smother it. I shut the door then propped myself on a red vinyl straight-back with cracks on the seat and looked across the desk at him. 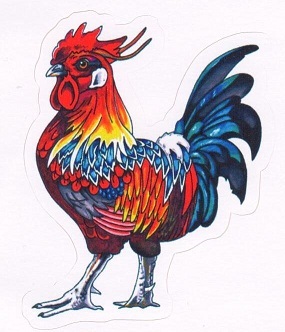 The chicken sat over his left shoulder on a shelf behind him. He looked back at the bird as if he’d yet to notice it. He chuckled at his own joke, and I laughed too, because I wasn’t sure what else to do. “How many do you have?” I asked. He paused as if unsure what to say next. The chicken clucked softly, seemingly unfazed by its surroundings. My stomach started to flitter, and I’m sure my pupils dilated. Crap, I thought. I should’ve been more careful. Should’ve spread it out over more months. My chair felt terribly uncomfortable. I gave him my panic face. Whew. Thank you, I thought. Someone is looking out for me. “It’s hard to say. I might think Vanessa, because she’s new. I can’t imagine anyone else.” I tried to maintain eye contact and not look away. A tell-tale sign of liars, I’d learned from watching cop shows. I nodded. My eyes started to water and I tried not to cry. “Thank you. I will.” I got up to leave.